*Redeem code 77URCPCHIP for a $77 Free Chip $77 casino chip comes with a 30 times wagering requirement and a maximum allowed withdrawal of $100. Allowed Games only. No multiple accounts or free chips in a row allowed. Standard free chip rules apply. 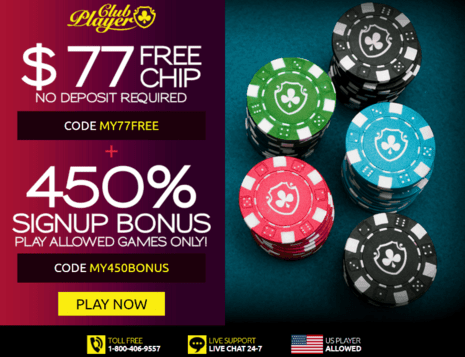 **Redeem code 450URCPBONUS to get a 450% Match Bonus 450% Signup Bonus comes with 30X Playthrough (60X Blackjack and Video Poker) and 10 times Maximum Cash-Out. Deposit $30 or more. Bonus is Non Cashable. Standard free chip rules apply.